Of course, motherhood is something we celebrate EVERYDAY.....but we show a little extra love + appreciation in MAY. 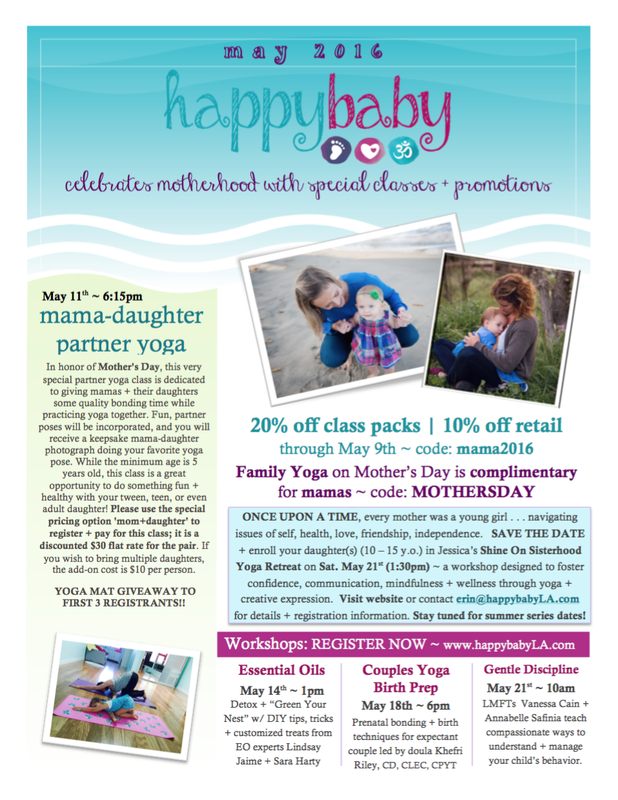 In case you've lost track of time (which, let's be honest, is VEEEEEERY easy to do when you're a mama), MOTHER'S DAY is this Sunday :) Not only is happy baby offering some special promotions (20% off class packs + 10% off retail), but we also have some fabulous workshops/special classes scheduled that will help add some relaxation, mindfulness + practical solutions to your life! Additionally, if you haven't heard, happy baby offers an ENTIRE SERIES of mama workouts, at times intended to cater to the varying schedules of working AND stay-at-home mamas. Full class descriptions are available here....but an overview is listed below. Some of these classes are more restorative to gently ease your body back into exercise (e.g. postnatal yoga), most are designed to kick your booty + make you sweat, and in all your pre-walking baby is welcome (though certainly not required) to join you for class.